Headaches affect everyone at some stage and can be debilitating, making it difficult to concentrate and function properly at home and at work. There are two classifications of headaches: organic headaches, which are caused by high blood pressure, eye disorders, inflammation of the middle ear or sinuses, dental pain, fever, colds, flu and disorders of sugar in the blood; and non-organic headaches, which are mainly caused by psychological or emotional reasons, stress, malfunctioning of some body parts or lifestyle changes. To prevent non-organic headaches, you should drink plenty of fluids, particularly water to keep the body – and indeed the brain – hydrated. To relieve the symptoms you can stretch and relax, especially with the lights dimmed and taking a cool bath will help rebalance the circulatory system. You should avoid drinking sodas and avoid eating citrus fruits, spices and chocolate, which can all exacerbate headaches. In addition it is a good idea to avoid using your cell phone too much, particularly for surfing the internet and messaging. Because the text on cell phones tends to be very small, some research suggests that reading it can lead to eye strain, as can the constant refocusing that the eye has to do between checking the phone and the wider world. 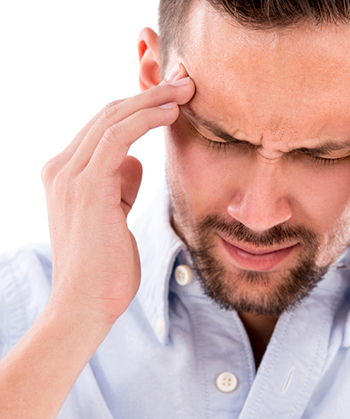 For organic headaches you really must consult a doctor to accurately diagnose and treat the underlying condition.